About > Blog > Your chance to win a FREE Meerkat Experience! Your chance to win a FREE Meerkat Experience! Wow, what an action packed month July promises to be! Firstly, coming up this Sunday, we’ll have our Teddy Bears Picnic – where every child with their teddy bear comes in at half price. Bring your own picnic, take a seat in our play area and even build your own bear! Then, we’re onto our BIG event! On the 16th July we’ll be celebrating our 25th Birthday. The event will be free for all ‘TF’ residents – just bring proof of address. It’s going to be an amazing day with appearances from the local Mayor, Signal 107 FM, our local police force, face painters and much much more! We end the month on the 28th July with our special Beatrix Potter Birthday Event – with live readings of your favourite stories and the opportunity to meet our own Peter Rabbit, Mrs Tiggywinkle and Jemima Puddleduck. Our African Civet needs a name – please email with your suggestion for the opportunity to win a free Meerkat Experience for 2. This month sees the sudden unexpected arrival of an African Civet. She will be on display from this weekend. We are extremely excited to be only the second place in the UK to display this stunning creature. Shaka our Caracal has also moved into his brand new enclosure. NEW animal experiences have launched this month, why not book a Binturong or a Wild Cat experience? Tanis is one of our Animal Husbandry and Encounter Assistants. He started with us on school work experience back in 2013 before moving on to college. After joining us as a volunteer, he quickly became an integral part of the team and now has a permanent part time position with us here at Hoo. He hopes to study Marine Biology at University and has a keen interest in reptiles. 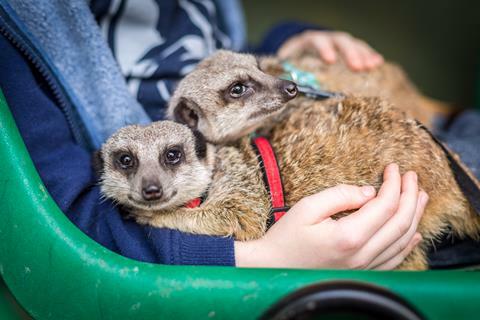 Louise Stanford suggested our animal this month, Louise is particularly fond of our hand-reared Meerkats as it was during her experience with them that she got engaged – we wish Louise and her husband to be lots of happiness and in the future. Both Kovu and Uuka our hand reared brothers came to us from a private collection. They are extremely friendly and love the attention that the experiences afford them.